I’ve always enjoyed gardening but I especially enjoy it in Northern Minnesota. The weather is much more pleasant then it was in Tennessee and even though the season is technically shorter, the long days ensure beautiful vegetables. I will say it was a bit of a surprise to find out that most folks don’t put anything in the ground until June 1st. Heck, in the south, we were planting in February some years. I had a nice garden last year. Rented a tiller and put in a nice, new garden spot. And, while my veggies did relatively well, it still took time for the soil to warm enough to get the plants a really great start. This year I’ve decided to do raised beds. This option will give me better control of what’s happening to my soil, water, and plants. Plan on Paper First: grab a piece of paper and simply draw out what you’d like your garden to look like, where you’d put different veggies, and determine how much space you’ll need. This is always fun for me. I can start to visualize what my garden will look like. Site Selection & Prep: Check out your property and decide where you will put your garden. Take into consideration sunlight, what the soil is like, and will you need to protect it from the “critters” that love a free meal. Soil Test: Once you’ve determined the site and unless you are doing raised beds, do a soil sample test. (The University of Minnesota can run the test for you). A soil test is an inexpensive way to determine what your soil is lacking. Once you have this information, you can add to the soil to make it prime planting soil. Planting: When I moved up here, I was told my several neighbors “do NOT put anything in the grown before June 1st”. It’s a good rule to go by. You can start plants inside in a sunny window or under a grow light, but wait until June 1st to put them in the ground outside. Also consider staggering your planting so you have a longer harvest time. For example, don’t plant all of your radish seeds at once. Plants some and then plant some again in 2 weeks. Water Management: My mother used to joke that the only way I’d remember to water my house plants was if I walked by the plant and it reached out a grabbed me and cried “please give me water.” While it is true that often neglected my house plants, I’m very good at ensuring my vegetables have water. Like Nutrients, plants have different water needs. Be sure to read the directions on the seed package or ask at the local nursery when you buy your vegetable plants. I use a rain barrel to capture water for my garden. It’s right there and easy to access. Weed Control: Raise your hand if you like weeding! Me, not so much. But I find if I spend a little time in the morning and in the evening, I can pretty much keep them under control. If needed, mulch or black plastic works well to keep weeds at bay. Pest Management: Nobody wants bugs eating their vegetables. I’m not a big fan of using “products” too keep them away. There are organic products that can help and I have been known to simply examine plants and pick the little buggers off. For me, insects have not been an issue. It’s the larger “pest” that I like to call wildlife that I must protect my garden from. You know...deer, raccoons, skunks, mice, rabbits, and yes, even bears. While I love the look of a cute little fence around the garden, in the North, we use 6 foot minimum and sometimes include a hot wire at the top. Bigger pest, mean bigger fences. OR you could simply plant 4 times as much as you need and share with Bambi and his friends. Your choice! Harvest: All of the hard work you’ve done leads to the best part of gardening; the Harvest! Check your garden daily and harvest what is ready. We enjoy fresh vegetables all season long. If you have an over abundance, can, freeze, or share with your friends. What tips do you have to share? I’d love to hear from you! 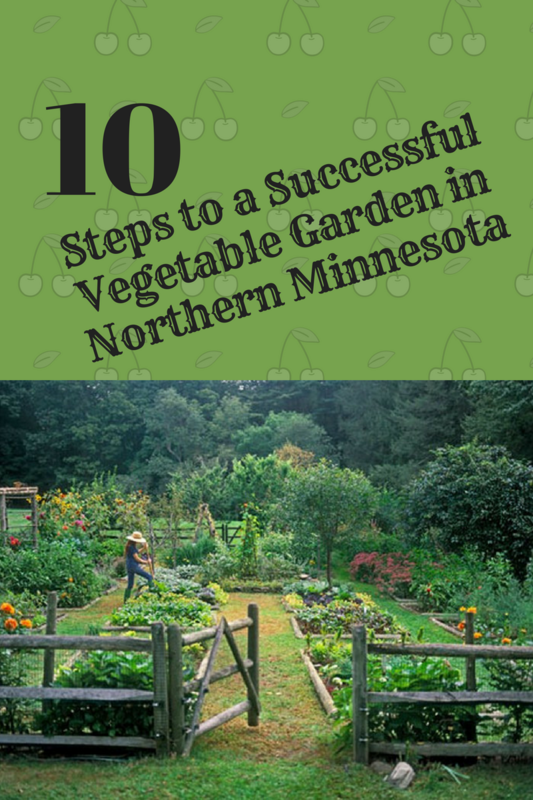 Enjoy your Northern Minnesota Garden! I know I do. Oh and by the way, the lovely picture on the cover of this blog is not my garden. It is my dream garden and one day I hope to be there!